Physics of critical phenomena at equilibrium has been established on the basis of various experiments, exact solutions and other approaches, which led to the invention of fundamental frameworks such as the renormalization group theory and the conformal field theory. One may ask then: does a similarly profound physics exist for systems driven out of equilibrium? 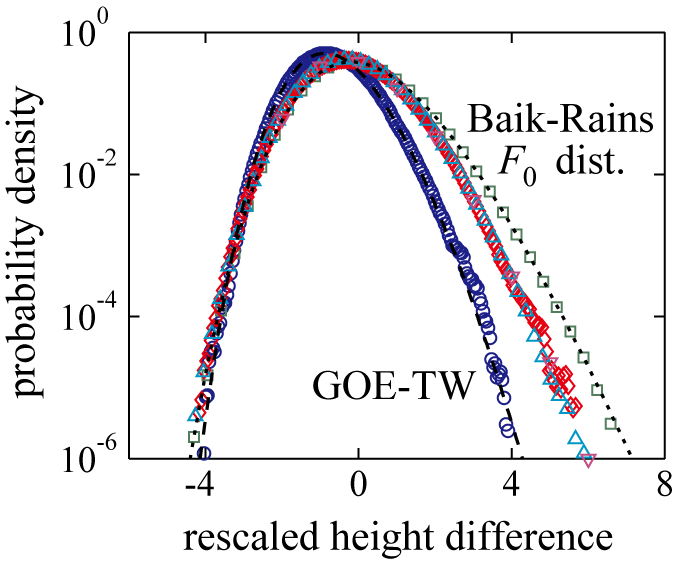 No one knows the answer yet, but recent theoretical developments on the Kardar-Parisi-Zhang (KPZ) universality class, the fundamental class describing random growth processes , have established an example in which various statistical properties can be derived exactly, despite being far from equilibrium . We are studying this problem experimentally, focusing on growing interfaces of turbulent domains in electrically driven liquid crystal convection. This turbulent state called DSM2 consists of densely entangled topological defects, and can be generated by shooting ultraviolet laser pulses under a sufficiently high voltage applied to the system. By changing the beam shape of the laser, we can generate both circular and flat interfaces (Movies 1 and 2). Measuring statistical properties of interface fluctuations, we obtain the same set of the KPZ scaling exponents for both cases, but nevertheless, fluctuations of the circular and flat interfaces are found to exhibit distinct distribution and correlation functions. 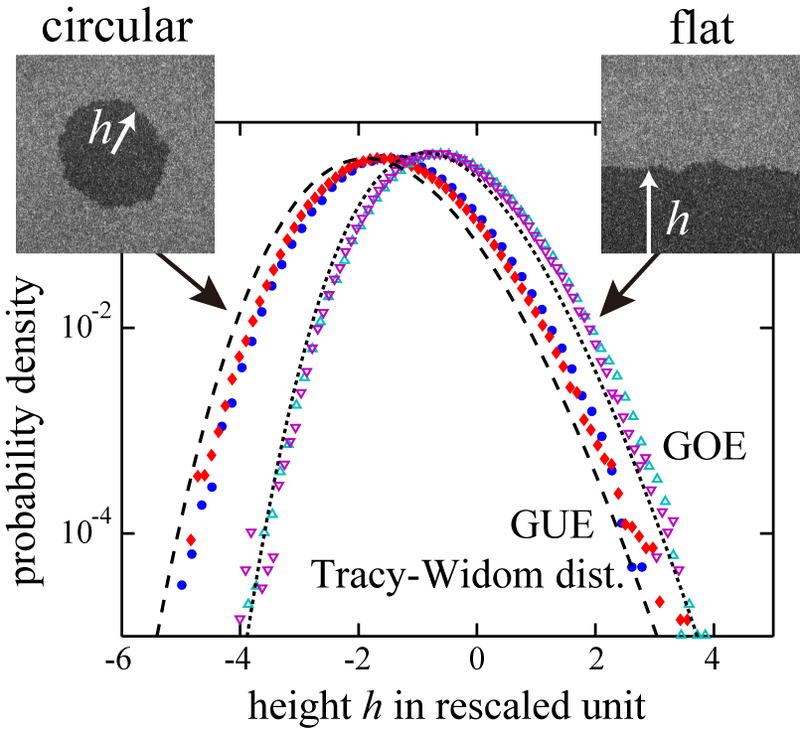 The obtained functions agree with the results previously derived for solvable models of the KPZ class ; in particular, the distribution function for the circular and flat interfaces is shown to be the largest-eigenvalue distribution for GUE and GOE random matrices, respectively, called the Tracy-Widom distribution in random matrix theory (see Fig. 1). This result implies that universality arises even in detailed statistical properties such as the distribution and correlation functions. Moreover, the KPZ class actually splits into a few universality "subclasses" according to the global geometry of interfaces (or the initial condition), characterized by different distribution and correlation functions: here we identified the circular (or curved) and flat subclasses [4,5]. Analytical developments on the KPZ class are remarkable, yet there do exist important statistical properties that remain unsolved, such as the time correlation. We are determining such unsolved properties experimentally, by means of careful analysis of the growing liquid-crystal turbulence. In particular, on the time correlation, we found even qualitative differences between the circular and flat interfaces, regarding symmetry between positive and negative fluctuations and persistence of correlation . $\Delta h(x,\Delta t, t_0) = h(x, t_0+\Delta t) - h(x, t_0)$. Thereby we found crossover between the flat and stationary subclasses, first numerically at high precision (Fig. 2), then we identified indications of the same crossover in the experiment . Similarly, we are currently playing with different interface geometries as an attempt to discover new KPZ subclasses as well as inter-subclass transitions. A.-L. Barabási and H. E. Stanley, Fractal Concepts in Surface Growth (Cambridge Univ. Press, Cambridge, 1995). For reviews on recent theoretical developments, see, e.g., T. Kriecherbauer and J. Krug, J. Phys. A 43, 403001 (2010) [web]; I. Corwin, Random Matrices Theory Appl. 1, 1130001 (2012) [web]. K. A. Takeuchi and M. Sano, Phys. Rev. Lett. 104, 230601 (2010) [pdf, web]. K. A. Takeuchi, M. Sano, T. Sasamoto, and H. Spohn, Sci. Rep. 1, 34 (2011) [pdf, web]. K. A. Takeuchi and M. Sano, J. Stat. Phys. 147, 853 (2012) [web]. K. A. Takeuchi, Phys. Rev. Lett. 110, 210604 (2013) [pdf, web].